[A] quick, painful and powerful correction is coming which will be much like the two -day massacre we witnessed just a couple of months ago. This time it’s on it’s way to an ultimate long-term target between $1,100 and $1,000/ozt. You can argue with me on this one until you pass out but that won’t change anything. Save your breath and prepare instead. Here’s how. 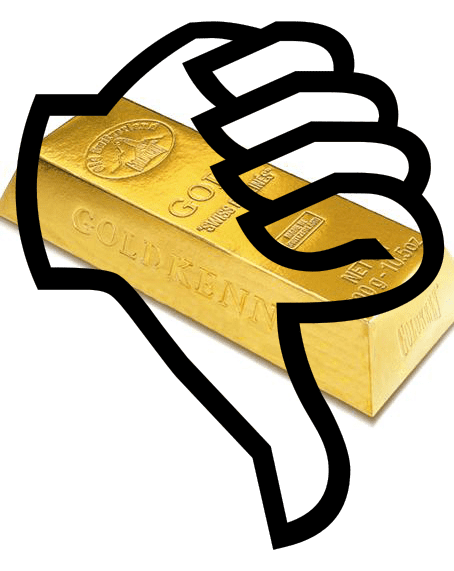 So writes Greg Guenthner (http://dailyreckoning.com) in further edited excerpts from his original article* entitled Coming Soon: Gold’s Next Breakdown. each time it fell, $1,350 marked the spot where buyers finally stepped in. Next A Stock Market Crash Followed This Occurrence In 1929, 2000 & 2007 – It’s Happening Again! I disagree, because I feel the charts are being “played” by the Central Banks. If you don’t think that PM’s are now being manipulated by the Central Banks, then I agree that you should not be investing in PM’s!